With the release of Portal 2, game developer Valve has followed-up the critically acclaimed original with more head-bursting puzzles, fanatical computers, and immersive story. We spoke with lead writer Erik Wolpaw, designer/engineer Jeep Barnett, and VP of marketing Doug Lombardi to find out how they created the setting of the game, what drives their innovative storytelling techniques, and more. Warning: beware of SPOILERS. Fast Company: When the decision was made to go ahead with Portal 2, what was the first challenge you faced? Erik: Probably the first challenge was, “What is Portal 2?” We actually went down this path in the very beginning where we thought that maybe Portal as a franchise is less about portals–which sounds crazy in retrospect–and more about introducing a new puzzle mechanic. And the common theme was Aperture Science, this kind of funhouse of science. We actually mocked up a version of Portal 2 that didn’t actually have portals. But we quickly discovered through playtesting that people wanted portals in their Portal 2–and GlaDOS, and the whole vibe of the first game. The game starts with an introduction to Wheatley, a Good AI compared to Bad AI of GlaDOS. But then he later betrays you. So, do you all feel computers will inevitably turn on you? Erik: Probably not–I would argue Wheatley has the best intentions and the GlaDOS chassis turned him evil–the mad power rush. I would say we are pro-technology at Valve. It’s just more interesting when you get to see a character become villainous. Any characters gets more interesting when you get to see how they would act if they were the villain. And we didn’t want to retread GlaDOS for another 10 hours of her being the villain. We needed someplace for her to go, so it wouldn’t be the same character arc for her as in Portal 1. With the 50s-era Aperture Science locales, were you paying homage to Bioshock and Fallout? Or was there another reason that you chose that time and style for a look into Aperture’s past? Erik: It wasn’t officially an homage to Bioshock–unfortunately, because of the immense amount of time to make games, I haven’t actually played through all of Bioshock. Primarily, we wanted to take you through the history of Aperture and we couldn’t think of any great reason that it would start in the 1840s. It just seemed like, and this is probably similar for these other games, it’s the past that is a scientifically plausible near past. The game starts with the confined testing chambers from Portal 1, but then opens up to spaces with more freedom. What were the issues you faced in creating those? Jeep: A lot of the challenges are the portal gun is line-of-site based–anything you see is potentially something you can put a portal. Trying to figure out how to make a space that feels epic and has this vista quality to it means you have to make a lot of those surfaces off limits, otherwise the player can jump from one side of a giant space to the other side. There’s a lot of challenge in trying to figure out how as the player is moving through this, in terms of a story space, how can you can make a gameplay space out of this and so they can travel through it in an interesting way. The Portal games are crafted using a way of telling a story that is unique to games, the experiential story that comes out of exploring environments. You save a “malfunctioning” turret from “redemption”, or the slow reveal of details about Caroline. How careful are you in setting the balance between story that is experienced or inferred and actual dialogue. Erik: We try an put as much as we can–if it were up to us we would get everything in the experiential side because that’s what games are good at, but you end up splitting the difference somewhere along the way. You have to do some exposition and you have the characters do their character moments. But whenever possible if we can offload it, plausibly, to do the environment or the experiential side, we definitely like to do that. But there’s no concrete formula. It’s just a subjective process of going through and working things over. You guys have a very iterative way of making levels. Is tweaking the amount of dialogue or story part of the iterations you go through as you create the game? Erik: It definitely is. Some of it, you are honing the material; some of it, you are responding to the changes being made to the gameplay as part of the iterative process. A concrete example is that originally GlaDOS was upset with you from the beginning of Portal 2, but she was a lot crueler than she is now. People were getting worn down by how cruel she was–we pulled back on that a little bit. That’s just one of the changes we made based upon feedback and playtesting. There is a sequence, “The Part Where He Kills You,” where character dialogue is layered with onscreen text and a game achievement for great effect. When you write the games, do you try to come up with storytelling techniques unique to games or does that naturally happen because of your process? Erik: I think it’s natural. You are always trying to do things you haven’t seen before. Obviously the people working on the games are well-versed in games and the history of games and you are always trying to think of something you haven’t seen in a game. We don’t start with a bulletpoint list–that one was opportunistic and someone along the line had the idea that this would be funny. Jeep: That achievement specifically, figuring out what we were going to name it, was kind of tricky. If we say the full sentence, are players going to get spoilers out of just the name of that achievement. Do we put in ellipses, or figure out when to cut off. Erik: “The Part Where He Kills You”–achievements are always leaked before games came out. People were confused and were thinking the He was about Cave. Luckily there were no real spoilers that ended up coming out. This achievement worked out well; people seemed to like that one. What about when creating the unique situations and locations in the game, do you try come up with experiences that are unique to Portal, or does that naturally happen? Jeep: It’s something natural. A lot of the test chambers we originally built as the future Aperture Science–where everything is nice and clean. As we figured out where in the pacing of the story, in the pacing of the mechanics, how everything fits together–once we sorted them out, we tried not to have too many things in the row that are really similar. If you do 3 or 4 really clean test chambers, then we have a broken floor where you go outside of the chamber and wander around behind the scenes. You figure out how everything is laid out, then later on layer on top, changing test chambers to being underground areas or other styles. Erik: Once we had story beats down, that this is going to take place: We are going to have old Aperture, we are going to have 1980s Aperture, we are going to have broken down test chambers, clean test chambers, Wheatley test chambers. Once you assemble the puzzles, you already have this style guide. Jeep: Then there’s co-op, where at the end of each section there is one level that takes place behind the scenes. With a lot of those, setting drove the puzzle. For example, there’s one level that has a giant air fan. We thought it looked really cool and would have a cool interaction with the dynamic lights. And we had to figure out how to build a puzzle around this fan. 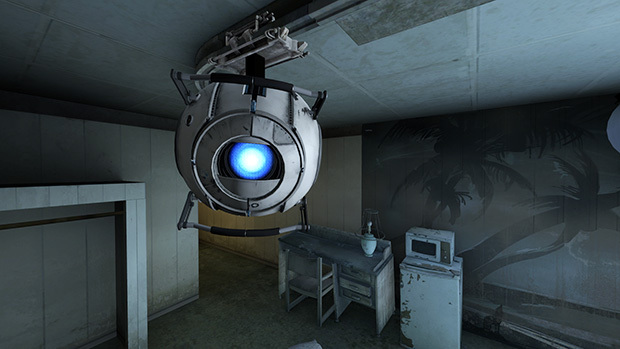 With the addition of Wheatley and Cave Johnson, the number of major speaking roles were tripled compared to the sole character of GlaDOS in the first. Were you worried about the balance? Did you want to take out characters? Add more characters? Erik: We started out with more characters and stripped it down–we wanted to make sure that the characters we had, that we had time to develop them. I think we ended up with enough time with the three major characters, that you really get a sense of who they are and see the arc that they go through. We knew from the beginning that 9 or 10 hours with just GlaDOS would probably be pushing it. We weren’t sure where we could go without complicating your relationship with her, without introducing these other characters. The game values human emotion over all else–the robots in the co-op game succeed in the end because they can show emotion; GlaDOS seems to get exasperated by Wheatley and wants to stop him; and by the end GlaDOS has had a change of heart and has decided to let Chell live. How much of this was a conscious effort? Erik: It was definitely conscious. GlaDOS does let Chell go, and then deletes her own human emotion–at least she is telling you she did. Having said that, we’re pro-human here at Valve. Jeep: Robot emotion themes in games don’t go far enough. Erik: It is kind of boring to write for robots, we’re happy to let the robots have plenty of human emotion. What did you learn from making Portal 2? Erik: You always learn some new stuff. If you want a credible comedic performance, don’t skimp on the comedic actors–they will deliver. Stephen Merchant was worth every penny we paid–as was J.K. Simmons. And Ellen McLain always does a great job, but she’s in a more modulated role than Stephen. Doug: Casting is a big thing there. You look at J.K. Simmons, and he was fantastic as Cave Johnson, but he’s not necessarily a name brand like Merchant is. But he was perfect for that part. I can remember seeing the viral short with temp voice, and we had other things that J.K. had already done, and you were able to already see how much better those were going to be after hearing his performance. It really is an X-Factor with some of those things. I don’t know what else we learned. We are kind of old guys and this is our 15th game or something. I don’t know that we’re learning that much. We are getting better. Jeep: We learned that we can’t predict what the memes are going to be. But, we actually already predicted that we wouldn’t know what the memes would be. Erik: You’re never quite sure what people are going to respond to in the game. You have a sense that it’s good and people will like it, but then it goes out in the wild and people latch on to something. Jeep: One guy makes an MS Paint picture, one random thing, and suddenly that’s the thing that everybody refers to. Doug: I think on the marketing side we learned a lot about A. producing our own collateral and B. making a lot of video to help demonstrate the character of the game and story of the game. We did hundreds of interviews and hundreds of demos, and we did 5 or 6 videos. And those videos dwarfed the demos and interviews we did. One cute, but kind of cheesy Valentine’s video lit up our preorders, our buzz, all the metrics that are used and collected by publishers and retailers. Each one of those videos, including the Valentine’s Day one, recalibrated how people were thinking about it at retail and in other places. There is a comic online, but beyond that, is there more Portal coming? Doug: We will be announcing some DLC for it, so folks can keep a look out for more content coming this summer. We’ll be putting more details out about that in a week or so. We’ll support that with more videos or more comics. 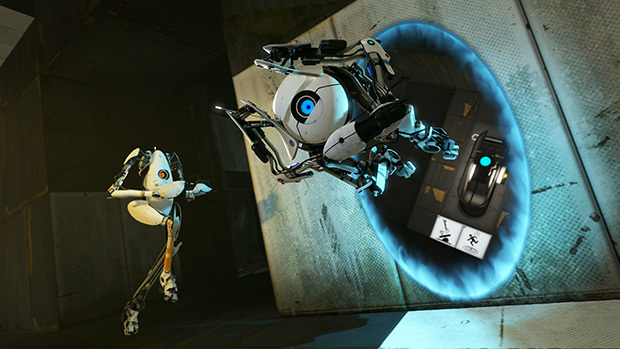 Valve’s Portal 2 is available now, for PC, Mac, PlayStation 3, and Xbox 360.